This, super simple recipe, is just delicious. Pictured above with wadds of bacon and a giant cup of tea, it goes well with an awful lot of things. Yesterday, I served these rolls with My ‘traditional ribs’ and it was a quite pleasant pairing. Plucked from the BBC’s Good Food web site, it isn’t My usual experiment and see what happens kind of dish. Having a mere four ingredients, anyone can whip these up in minutes. I think this is a good one to teach to kids, since it doesn’t require cooking and can be jazzed up with just about anything. If You are looking for a quick, satisfying snack, or if You need something that can be made well ahead of having company over, this one is a winner. Serves 8, or half that many hungry teenagers. Lay out a tortilla and spread 1/4 cup of pesto all over it. Add cheese to half and spread arugula evenly. 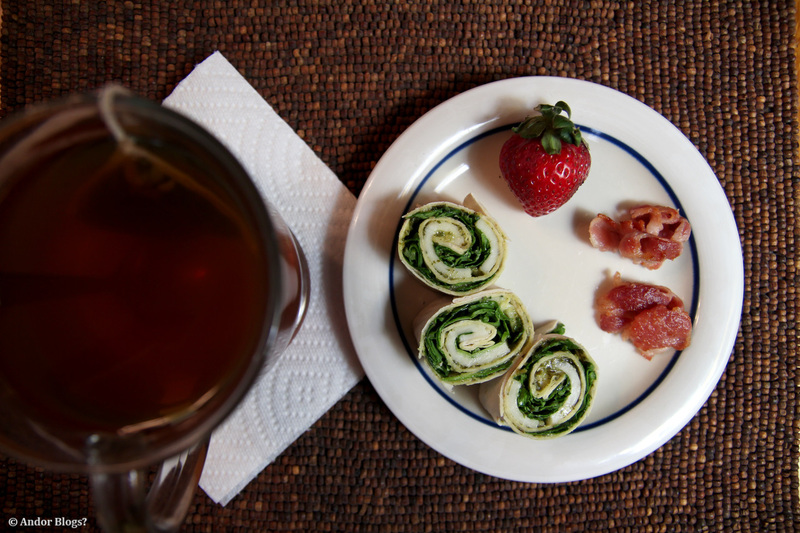 Roll it up, starting from the cheesy side and slice for serving, or refridgerate for later. Yeah, that’s it. Shredded mozzarella nullifies the need for any pre-assembly prep. The original recipe called for two sheets of lahvash flat bread instead of tortillas. Adding bacon, thinly sliced pastrami, or some such thing makes this into more of a meal than a snack food. Experiment! Such a simple flavor combination goes well with a lot of different things.